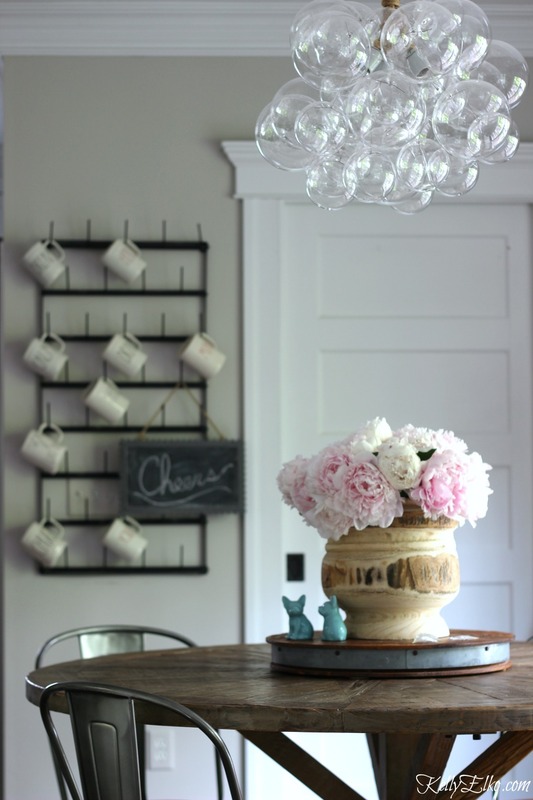 Everything in moderation … except peonies! 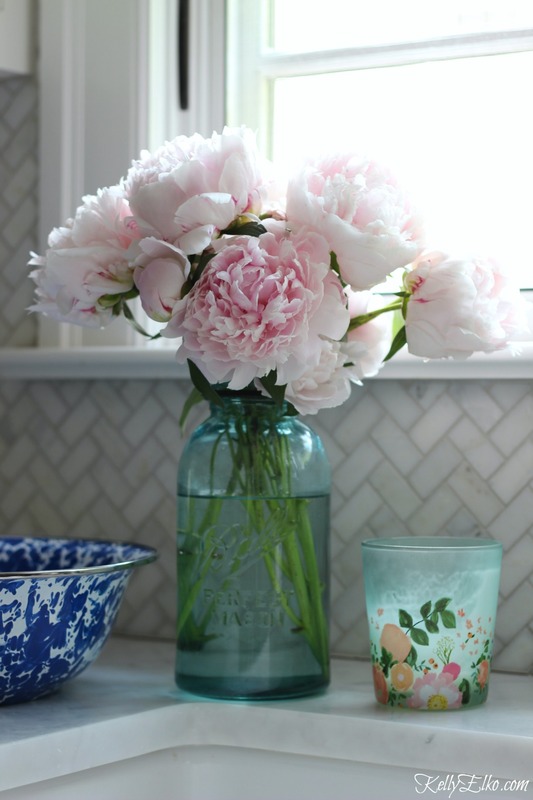 I’m sharing my tips and tricks on how to make peonies last longer. 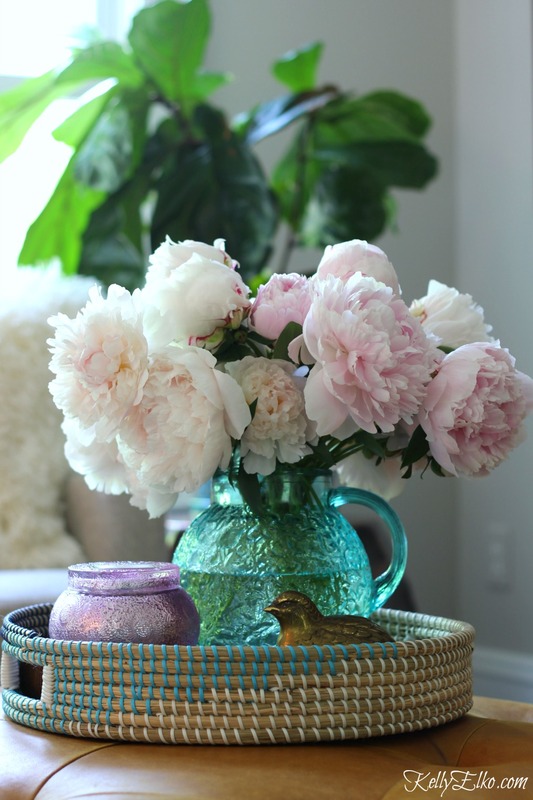 Plus see how I use unique vases scattered throughout my house to display my abundance of blooms! I only have three peony bushes but they produce armloads of blooms! Like a kid in a candy store, I rush outside and gather up these precious little morsels and fill my house with their beauty. Make sure to use peony supports HERE so your flowers don’t topple to the ground. Clean all of your tools including bucket, shears (I like these pruning shears) and vase using 1 teaspoon bleach to one gallon of water. Add lukewarm water to the bucket and bring everything outside. Cut in early morning (after the dew dries) or early evening. Although it’s tempting, don’t cut all of your peonies from your bush (leave 1/3 to 1/4 of the flowers which will help the bush conserve energy for next year). When buds are just starting to open and feel soft like marshmallows (give them a squeeze), it’s time to bring them inside. 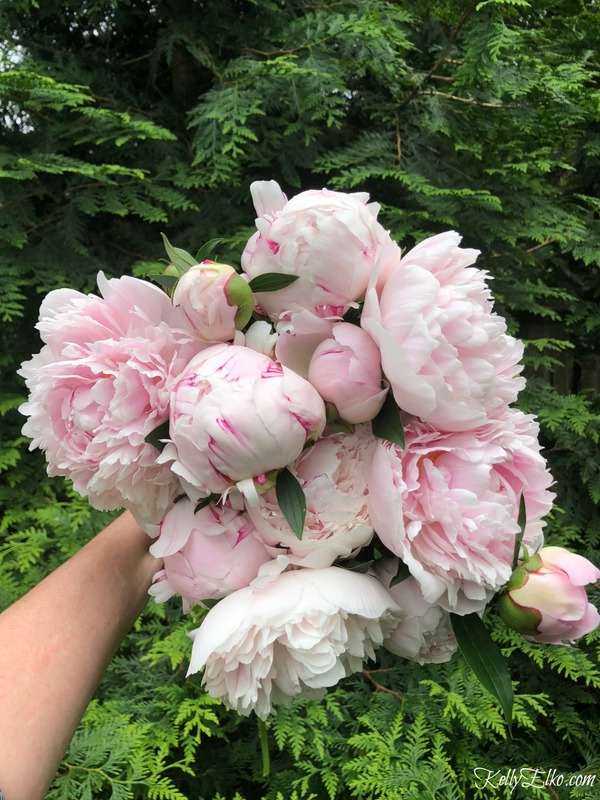 (If you cut peonies when they are fully open, they will be stunning but only last a few days and if you cut them when the buds are tight and hard, they may not open). If you have more than one bud per stem, and some of the blooms are fully open, try to wait a day or two to cut those stems until the smaller buds are ready too. Use good quality pruning shears (I love these shears) and make sure to clean them with bleach before you use them so as not to spread disease. 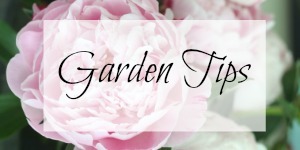 Cut each peony stem to a length of 14-18 inches and make sure to leave one to three pairs of leaves on the part of the stem that remains on the plant. Ants love peony nectar so if you see them crawling on your buds, just shake them off. Cut the lower portion of leaves from your stem then place in your bucket of water. The size of your vase will determine how much more stem to cut (you may want to vary the height so flowers in the middle of the vase are taller) but make sure that you cut off all leaves that will sit below water level. Cut stems again (at least an inch) on the diagonal using sharp shears and add to your vase of lukewarm water. Don’t put flowers in direct sunlight. Change water every few days and recut the stems. 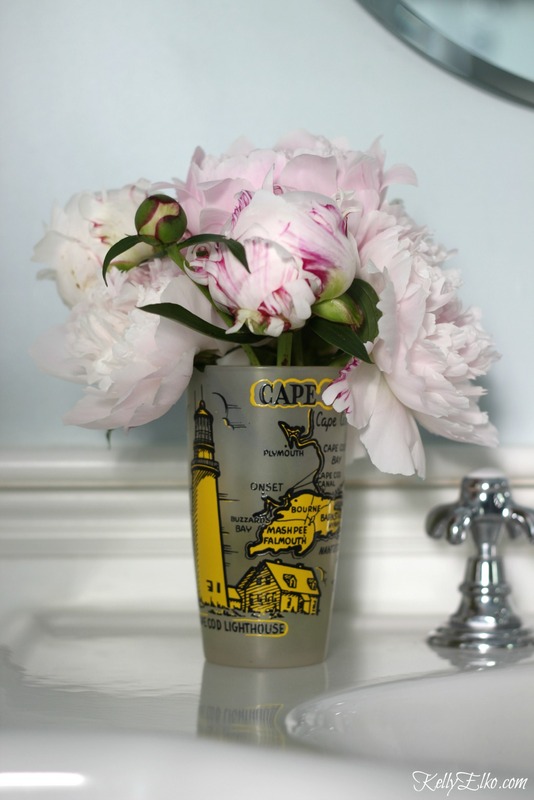 Remove flowers from vase when they are past their prime and move peonies that still look good to a smaller vase. Now let’s take a look at my peony haul! Put them where you will enjoy them the most. A wow of a kitchen table centerpiece, on the ottoman in the family room where we watch TV, next to the kitchen sink (where I unfortunately spend way too much time), and a tiny surprise in my bathroom. 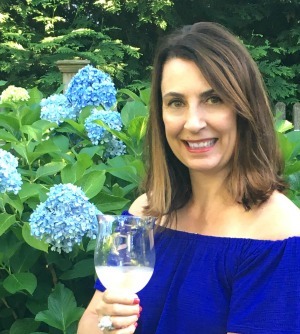 I love to get creative with vases and this vintage blue pitcher is a favorite and you can never go wrong with a blue mason jar (especially one this big). What a treat it is to enjoy this little vintage state glass filled with blooms as I primp every morning and night. 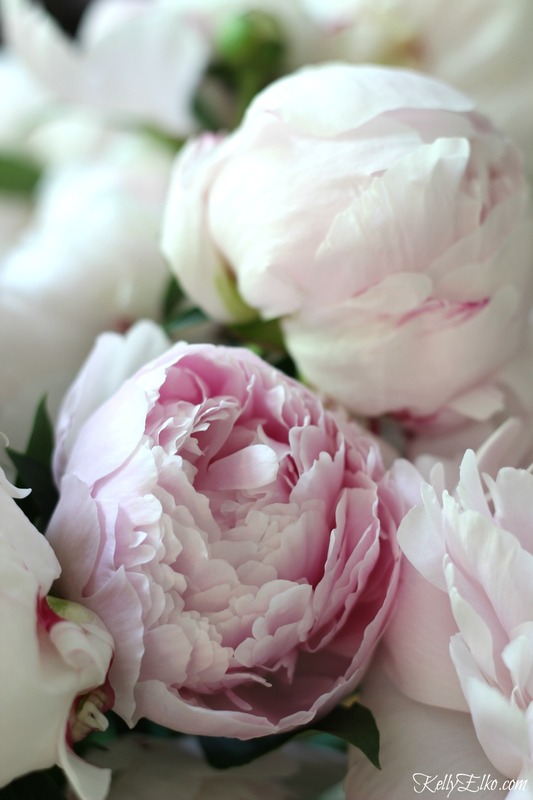 Enjoy peonies all year long – I made this FREE Peony Printable for you to download and frame. Don’t miss more of my gardening posts HERE. 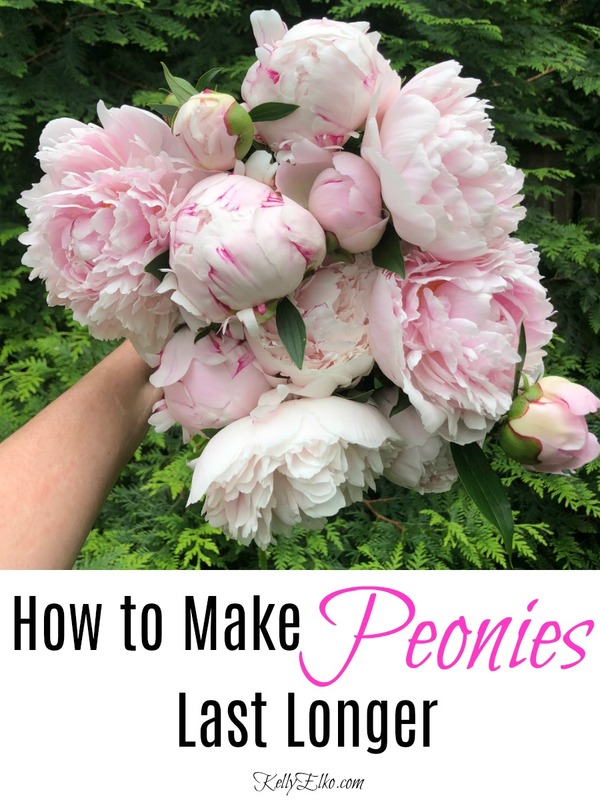 I love sharing how to make peonies last longer … but wish they lasted forever! Thanks for tips. Mine have already come and gone now. Unfortunately I was out of town when they started to bloom. So I was not able to bring my beautiful blooms inside. There is such a short window to appreciate these flowers. I definitely will be purchasing some of those supports next year. Thanks for sharing. Have a great day! Definitely a short window! Fingers crossed you get to enjoy them next year Hope! Thanks so much for all the pointers, any information i can get to help them last longer i will try. Yours are certainly beautiful. 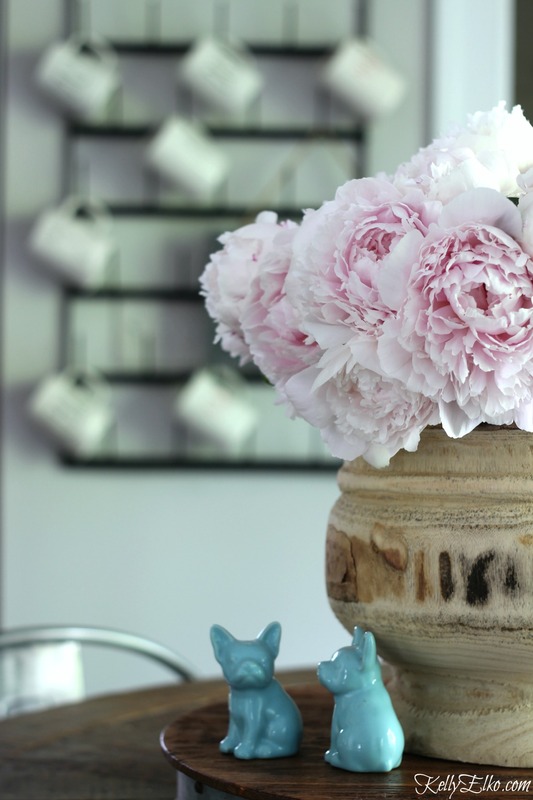 Thanks Marlene – I can’t get enough of these peonies! Thank you so much for the pointers. My peonies were very prolific this year. However I did not have supports so I lost many to the mud. I was surprised I could not find them locally. We had a lot of storms so they took a beating. I still had plenty but now know the best time to cut so they last longer. I am going to order some stakes now so I will have them for next year so I am prepared! The supports make all the difference Beth! Next year, I foresee some very happy peonies in your garden! I love this post! 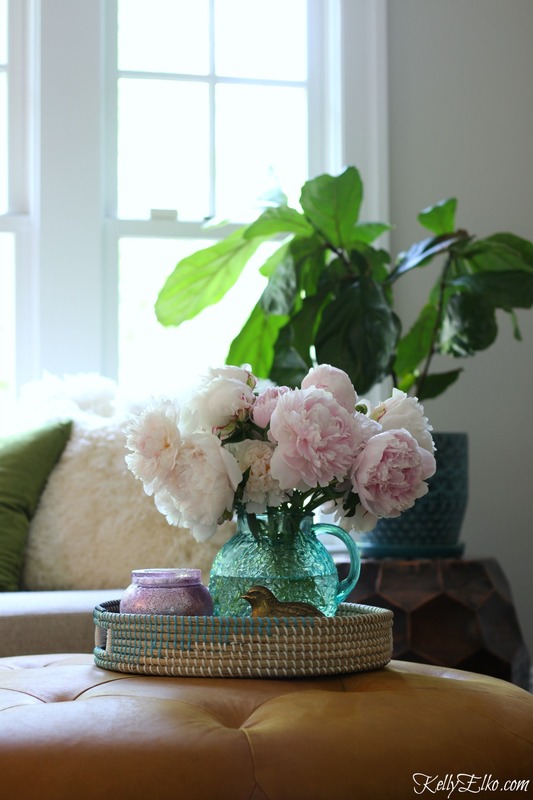 And your state glass-vase as well as the turquoise vases…those colors are fabulous together. Thank you Suzanne! 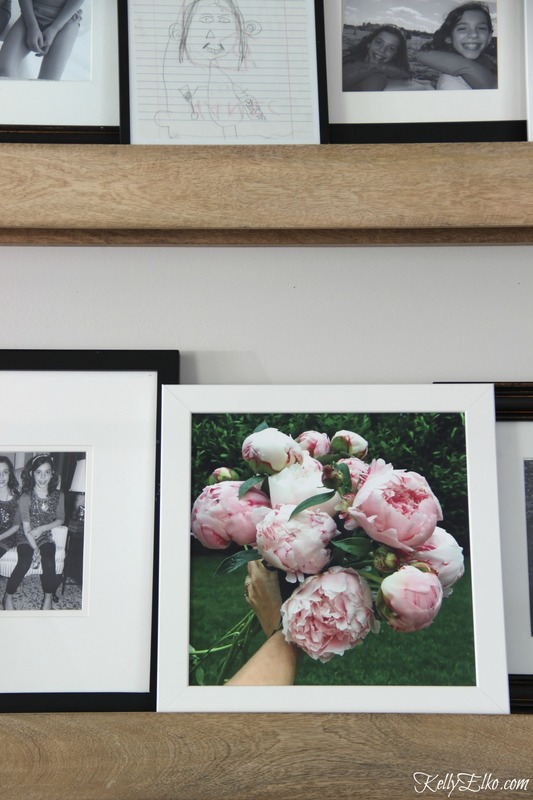 I don’t know how I ever lived without peonies! Stunning Kelly! Peonies are very special to my boyfriend. His Aunt grew them at his old house and we had to move. I took some and planted them at our new house. The first 2 years we didn’t get any flowers but we think one will bloom shortly. It’s so special to him and im thrilled they survived moving. His Aunt did pass away, so this plant has such special meaning. Great tips. Hopefully next year I can make a bouquet for in the house. World’s greatest girlfriend award goes to you! Once transplanted, it could take a few years for them to bloom so hoping you get some next spring! Aww thank you Kelly! You are sweet. Guess we just have to be patient. One bloom is better than none. LOL – any little bit is good! Hi my Jersey Girl! Glad you enjoyed your blooms!